Sibutramine (usually in the form of the hydrochloride monohydrate salt) is an oral anorexiant. Until 2010 it was marketed and prescribed as an adjunct in the treatment of exogenous obesity along with diet and exercise. It has been associated with increased cardiovascular events and strokes and has been withdrawn from the market in countries and regions including Australia, Canada, China, the European Union (EU), Hong Kong, India, Mexico, Thailand, the UK, and the United States. Sibutramine is a centrally-acting serotonin-norepinephrine reuptake inhibitor structurally related to amphetamines, although its mechanism of action is distinct. Sibutramine was originally developed and marketed by Knoll Pharmaceuticals and was most recently manufactured and marketed by Abbott Laboratories before its withdrawal from the market. It was sold under a variety of brand names including Reductil, Meridia and Sibutrex. It is classified as a Schedule IV controlled substance in the United States. Sibutramine is well absorbed from the GI tract (77%), but undergoes considerable first-pass metabolism, reducing its bioavailability. The drug itself reaches its peak plasma level after 1 hour and has also a half-life of 1 hour. Sibutramine is metabolized by cytochrome P450 isozyme CYP3A4 into two pharmacologically-active primary and secondary amines (called active metabolites 1 and 2) with half-lives of 14 and 16 hours, respectively. Peak plasma concentrations of active metabolites 1 and 2 are reached after three to four hours. The following metabolic pathway mainly results in two inactive conjugated and hydroxylated metabolites (called metabolites 5 and 6). Metabolites 5 and 6 are mainly excreted in the urine. Despite having a mechanism of action similar to tricyclic antidepressants, sibutramine has failed to demonstrate antidepressant properties in animal studies. It was approved by the U.S. Food and Drug Administration (FDA) in November 1997 for the treatment of obesity. A higher number of cardiovascular events has been observed in people taking sibutramine versus control (11.4% vs. 10.0%). In 2010 the FDA noted the concerns that sibutramine increases the risk of heart attacks and strokes in patients with a history of cardiovascular disease. Sibutramine has a number of clinically significant interactions. The concomitant use of sibutramine and monoamine oxidase inhibitors (MAOIs, such as selegiline) is not indicated, as it may increase the risk of serotonin syndrome, a somewhat rare but serious adverse drug reaction. Sibutramine should not be taken within two weeks of stopping or starting an MAOI. Taking both sibutramine and certain medications used in the treatment of migraines—such as ergolines and triptans—, as well as opioids, may also increase the risk for serotonin syndrome, as may the use of more than one serotonin reuptake inhibitor at the same time. The concomitant use of sibutramine and drugs which inhibit CYP3A4, such as ketoconazole and erythromycin, may increase plasma levels of sibutramine. Sibutramine does not affect the efficacy of hormonal contraception. Studies are ongoing into reports of sudden death, heart failure, renal failure and gastrointestinal problems. Despite a petition by Ralph Nader-founded NGO Public Citizen, the FDA made no attempts to withdraw the drug, but was part of a Senate hearing in 2005. Similarly, Dr. David Graham, FDA "whistleblower", testified before a Senate Finance Committee hearing that sibutramine may be more dangerous than the conditions it is used for. A large randomized-controlled study with 10,742 patients (SCOUT) examined whether or not sibutramine administered within a weight management program reduces the risk for cardiovascular complications in people at high risk for heart disease and concluded that "Six-week treatment with sibutramine appears to be efficacious, tolerable and safe in this high-risk population for whom sibutramine is usually contraindicated." In a dissenting article, "Sibutramine: gone, but not forgotten"  Professor David Haslam (ex-president of the Royal College of General Practitioners and currently chairman of the National Obesity Forum) says that the SCOUT study is flawed as it only covered high risk patients and did not consider obese patients who do not have cardiovascular complications or similar contra-indications. The FDA is reviewing preliminary data from a recent study suggesting that patients using sibutramine have a higher number of cardiovascular events (heart attack, stroke, resuscitated cardiac arrest, or death) than patients using a placebo. The preliminary data shows that cardiovascular events were reported in 11.4% of patients using sibutramine compared to 10% of patients using a placebo. This difference is higher than expected, suggesting that sibutramine is associated with an increased cardiovascular risk in the study population. The analysis of these data is ongoing and FDA is making no conclusions about the preliminary findings at this time. These findings highlight the importance of avoiding the use of sibutramine in patients with a history of coronary artery disease (heart disease), congestive heart failure (CHF), arrhythmias, or stroke, as recommended in the current sibutramine labeling. On January 21, 2010, the European Medicines Agency recommended suspension of marketing authorizations for Sibutramine following a six-year study which showed an increased risk of non-fatal but serious cardiovascular events in patients with a known or high risk for cardiovascular disease. In August 2010 the FDA added a new contraindication for patients over 65 years of age due to the fact that clinical studies of sibutramine did not include sufficient numbers of such patients. Abbot laboratories announced on October 8, 2010 that it is withdrawing sibutramine from the US market under pressure from the FDA, citing concerns over minimal efficacy coupled with increased risk of adverse cardiovascular events. On December 22, 2008, the United States Food and Drug Administration issued an alert to consumers naming 27 different products marketed as “dietary supplements” for weight loss, that illegally contain undisclosed amounts of sibutramine. In March 2009, Dieter Müller et al. published a study of sibutramine poisoning cases from similar Chinese "herbal supplements" sold in Europe, containing as much as twice the dosage of the legally licensed drug. An additional 34 products were recalled by the FDA on April 22, 2009, further underscoring the risks associated with unregulated "herbal supplements" to unsuspecting persons. This concern is especially relevant to those with underlying medical conditions incompatible with undeclared pharmaceutical adulterants. In January 2010, a similar alert was issued for counterfeit versions of the over-the-counter weight loss drug Alli sold over the Internet. Instead of the active ingredient orlistat, the counterfeit drugs contain sibutramine, and at concentrations at least twice the amount recommended for weight loss. In October 2010 the MHRA in the UK issued a warning regarding "Payouji tea" and "Pai You Guo Slim Capsules" which were found to contain undeclared quantities of Sibutramine. Some illegal weight loss products imported into Ireland have been found to contain sibutramine. In October 2011, the FDA warned that 20 brands of dietary supplements were tainted with sibutramine. Sibutramine and its two active N-demethylated metabolites may be measured in biofluids by liquid chromatography-mass spectrometry. Plasma levels of these three species are usually in the 1-10 μg/L range in persons undergoing therapy with the drug. The parent compound and norsibutramine are often not detectable in urine, but dinorsibutramine is generally present at concentrations of >200 μg/L. 1. 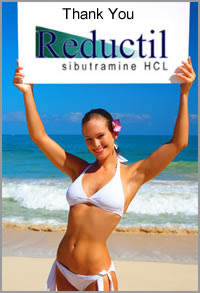 ^ "Sibutramine (brand name Reductil) Information - Australia". Abbott Laboratories. 2010. Retrieved 2010-10-08. 2. ^ Health Canada Endorsed Important Safety Information on MERIDIA (Sibutramine Hydrochloride Monohydrate): Subject: Voluntary withdrawal of Meridia (sibutramine) capsules from the Canadian market. 3. ^ "Notification of Termination of Production, Sale, and Usage of Sibutramine Preparations and Their Active Pharmaceutical Ingredient". sda.gov in People's Republic of China. October 30, 2010. Retrieved 2011-05-21. 5. ^ "De-registration of pharmaceutical products containing sibutramine" (Press release). info.gov in Hong Kong. November 2, 2010. Retrieved 2010-11-08. 6. ^ "Banned Medicines" (Press release). Ministry of Health and Family Welfare. February 10, 2011. Retrieved 2011-03-15. 7. ^ "Thai FDA reveals voluntary withdrawal of sibutramine from the Thai market" (Press release). Food and Drug Administration of Thailand. October 20, 2010. Retrieved 2010-12-22. 8. ^ "Top obesity drug sibutramine being suspended". BBC News. 2010-01-22. Retrieved 2010-01-22. 9. ^ Rockoff, Jonathan D.; Dooren, Jennifer Corbett (October 8, 2010). "Abbott Pulls Diet Drug Meridia Off US Shelves". The Wall Street Journal. Retrieved 8 October 2010. 12. ^ "FDA APPROVES SIBUTRAMINE TO TREAT OBESITY" (Press release). U.S. Food and Drug Administration. November 24, 1997. Retrieved 2007-04-29. 14. ^ "Early Communication about an Ongoing Safety Review ofÂ Meridia (sibutramine hydrochloride)". 15. ^ "Meridia (sibutramine hydrochloride): Follow-Up to an Early Communication about an Ongoing Safety Review". 16. ^ a b c "Meridia Side Effects, and Drug Interactions". RxList.com. 2007. Retrieved 2007-04-29. 17. ^ (Portuguese) Cloridrato de sibutramina monoidratado. Bula. [Sibutramine hydrochloride monohydrate—label information]. Medley (2007). 18. ^ Wolfe, Sidney M.; Larry D. Sasich, Elizabeth Barbehenn (March 19, 2002). "Petition to FDA to ban the diet drug sibutramine (MERIDIA) (HRG Publication #1613)". Public Citizen. Retrieved 2007-04-29. 19. ^ Bruce Japsen (13 March 2005). "FDA weighs decision on Meridia ; Health advisory likely for Abbott obesity drug". Chicago Tribune. Chicago, Illinois. pp. 1. 20. ^ Hearing of 17 November 2004. Related CBS news item 19 November 2004. 25. ^ Pollack, Andrew (October 8, 2010). "Abbott Labs Withdraws Meridia From Market". The New York Times. 26. 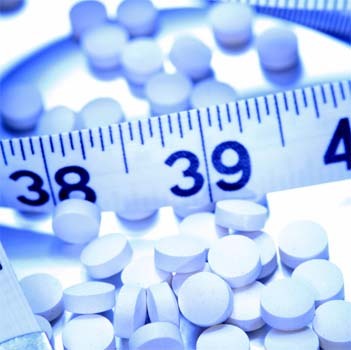 ^ "FDA warns consumers about tainted weight loss pills" (Press release). U.S. Food and Drug Administration. 22 December 2008. 27. ^ "Consumer directed questions and answers about FDA’s initiative against contaminated weight loss products". U.S. Food and Drug Administration Center for Drug Evaluation and Research. 22 December 2008. 29. ^ WebMD April 22nd 2009 publication of FDA recall information. 22 April 2009. 30. ^ "Fake Alli diet pills can pose health risks". CNN.com. January 23, 2010. Retrieved 2010-01-24. 31. ^ "Herbal diet product poses heart risk". CBC News. March 26, 2010. 38. ^ Jain DS, Subbaiah G, Sanyal M, et al. Liquid chromatography/electrospray ionization tandem mass spectrometry validated method for the simultaneous quantification of sibutramine and its primary and secondary amine metabolites in human plasma and its application to a bioequivalence study. Rapid Comm. Mass Spec. 20: 3509-3521, 2006. 39. ^ Thevis M, Sigmund G, Schiffer AK, Schänzer W. Determination of N-desmethyl- and N-bisdesmethyl metabolites of Sibutramine in doping control analysis using liquid chromatography-tandem mass spectrometry. Eur. J. Mass Spec. 12: 129-136, 2006. 40. ^ R. Baselt, Disposition of Toxic Drugs and Chemicals in Man, 8th edition, Biomedical Publications, Foster City, CA, 2008, pp. 1426–1427. 41. ^ James E. Jeffery, Antonin Kozlik, Eric C. Wilmshurst, U.S. Patent 4,746,680, (1988). 42. ^ James E. Jeffery, Antonin Kozlik, Eric C. Wilmshurst, U.S. Patent 4,806,570, (1989).